For many ‘40 somethings’, the name John Craven will be etched in the memory forever as the presenter who originated, and anchored a news show for children that has run continuously since 4th April, 1972. Back then it was called John Craven’s Newsround whereas now, ‘Newsround’ is the title of this quirky news magazine programme. Along with Doctor Who, Jackanory, Play School, Mr. Benn and Magic Roundabout, the BBC had a monopoly on producing high quality children’s programming that stood the test of time and remain benchmarks of educational public service television (BBC was the main provider of PSB). John Craven presented Newsround until his departure in 1989 but curiously, every presenter that replaced him, either temporarily or afterwards seemed to look like him – as frivolous a comment as this may be, his iconic status was considerable and it was at the time, one of the world’s first television news programmes aimed at 6-12 year olds, a difficult audience to engage. 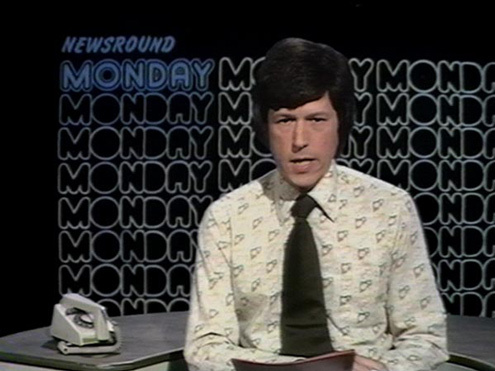 The mode of address of John Craven’s Newsround was of course informal, but friendly and welcoming, carefully mediating a news agenda that would interest young people. Interestingly at the time this didn’t always mean not reporting on war and conflict – in true BBC fashion, the programme sometimes clumsily soft sold hard news by using words like “bad people? and “not very nice? to avoid any essence of fear or confrontation with what was, and is a very vulnerable target audience. The BBC Children’s Department originally commissioned John Craven’s Newsround as a short series but it quickly picked up a loyal target audience in the days before multichannel television when in 1972, only three terrestrial channels broadcast to the UK – BBC1 One, ITV (1955) and BBC Two (1964).